Catch our inspiring & encouraging weekly messages from Ps. E & others right here! 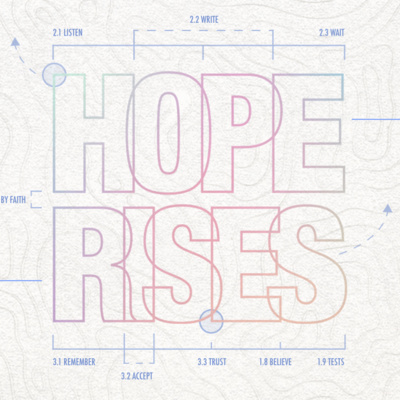 HOPE RISES: WEEK 1 - "EASTER"
Everyone likes the idea of hope, but what happens when the floor falls out from under us and we find ourselves feeling broken, abandoned or forgotten? Sometimes we experience a suffering that doesn’t even have a purpose, so what do we do when we “believe” but we’re also wrestling with unbelief? Can HOPE rise up in the midst of our pain? Of our suffering. Of our chaos or confusion. 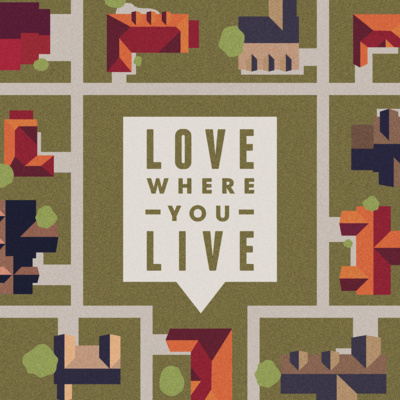 Love Where You Live: Week 4- "Invite Boldly"
This series is based around the fact that Jesus believed changing the world began with loving your neighbor. So what would happen if a group of people actually took this seriously? And not metaphorically, but practically? What if we decided to invest the best of who we are into the people, places & problems we’re living in the midst of right now? What would it look like to really love where you live? Love Where You Live: Week 3- "Serve Collectivly"
Love Where You Live: Week 2- "Start Tiny"
Jesus believed changing the world began with loving your neighbor. But what would happen if a group of people actually took that seriously? And not metaphorically, but practically? What if you & I decided to invest the best of who we are into the people, places & problems we’re living in the midst of right now? What would it look like to really love where you live? Over these next several weeks we want you all to care inclusively instead of staying inside your own little bubble, we want you to start tiny instead of doing nothing because you can’t do a big thing, we want you to serve collectively instead of trying to change the world all by yourself, and we want you to invite boldly instead of serving God in silence. LOVE WHERE YOU LIVE: Week 1 - "Care Inclusively"
Jesus believed changing the world began with loving your neighbor. But what would happen if a group of people actually took that seriously? And not metaphorically, but practically? What if you & I decided to invest the best of who we are into the people, places & problems we’re living in the midst of right now? What would it look like to really LOVE WHERE YOU LIVE? Over these next several weeks we want you all to care inclusively (instead of staying inside your own little bubble), we want you to start tiny (instead of doing nothing because you can’t do a big thing), we want you to serve collectively (instead of trying to change the world all by yourself), and we want you to invite boldly (instead of serving God in silence). So we have been talking about money. Where did what you have come from? What is it for? And why does what you do with it matter? It’s important that we as a church intentionally carve out time to do an entire series on money, because money is a big part of life. We want to help you realize that everything you have is from God and He gave it to you in order to empower you to expand His Kingdom. We want to encourage you to leverage the practice of percentage giving to regularly remind yourselves that God is your priority & your provider. We also want to inspire you to make it your very own personal goal to increase your generosity year-after-year as you grow in faith. Our aim is never to shame or intimidate or demand anything from you. We want to educate & inspire you to leverage what you’ve got in this life to make your life worthwhile. 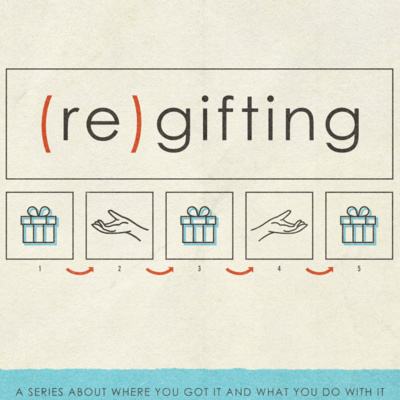 (re)GIFTING: Week 2 - What Is Your Priority? This series is about MONEY. Where did what you have come from? What is it for? And why does what you do with it matter? And the consensus out there is, “Why do churches talk so much about money?” Now, I cannot speak to what other churches do. But here at South Hills, we intentionally carve out time to do an entire series on money, about once or twice a year. And we do this because money is a big part of life. We want to help you realize that everything you have is from God and He gave it to you in order to empower you to expand His Kingdom. We want to encourage you to leverage the practice of percentage giving to regularly remind yourselves that God is your priority & your provider. We also want to inspire you to make it your very own personal goal to increase your generosity year-after-year as you grow in faith. And we want to talk about real life too. We don’t want to avoid the subject of money because Jesus didn’t. He talked a lot about money. He said more about money & materialism than he did about heaven. In fact, he told 35 parables & out of them, 16 had to do with money & possessions. So anything Jesus wasn’t silent on, we don’t want to be either. But I do promise you this, our aim is never to shame or intimidate or demand anything from you. We want to educate & inspire you to leverage what you’ve got in this life to make your life worthwhile. And I hope that’s your experience here over these next few weeks. 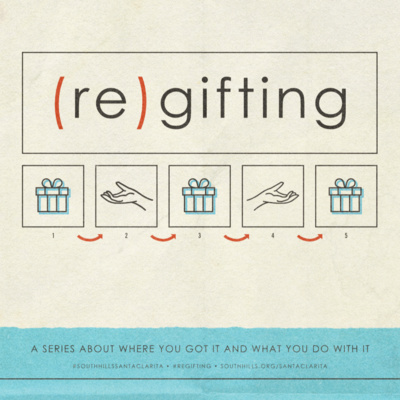 (re)GIFTING: Week 1- "Whose Money Is It? This series is about MONEY. Where did what you have come from? What is it for? And why does what you do with it matter? And a lot of people think, “Why do churches talk so much about money?” Now, I can’t speak to what other churches do. But here at South Hills, we intentionally carve out time to do an entire series on money, only about once or twice a year. And we do this because money is a big part of life. We want to help you realize that everything you have is from God and He gave it to you inorder to empower you to expand His Kingdom. We want to encourage you to leverage the practice of percentage giving to regularly remind yourselves that God is your priority & your provider. We also want to inspire you to make it your very own personal goal to increase your generosity year-after-year as you grow in faith. And we want to talk about real life. We also don’t want to avoid the subject of money because Jesus didn’t. He talked a lot about money. He said more about money & materialism than he did about heaven. Jesus told 35 parables & out of them, 16 had to do with money & possessions. So anything Jesus wasn’t silent on, we don’t want to be either. But I promise you, our aim is never to shame or intimidate or demand anything from you. We want to educate & inspire you to leverage what you’ve got in this life to make your life worthwhile. And I hope that’s your experience here over these next couple weeks. LOVE HANDLES: Week 4- "Love Handles Failures"
We’re all looking for love. Deep down inside we’re wanting our romantic relationships to be full of love. And on the flipside...we are also wanting our core relationships to work well. And they do. Well….. some of them. Some…. of the time. You see...It’s easy for us to love people when they act lovable. But what about the rest of the time? What about when they hurt us? Or fail us? Or what about the moments when we realize just how different we really are? What do we do then? What’s the right thing to do? The healthy thing to do? How does love handle those difficult moments? LOVE HANDLES: Week 3 "Love Handles Differences"
We’re all looking for love. Deep down inside we’re wanting our romantic relationships to be full of love. And on the flipside...we are also wanting our core relationships to work well and be infused with love. And they do. Well….. some of them. Some…. of the time. You see...It’s easy for us to love people when they act lovable. But what about the rest of the time? What about when they hurt us? Or fail us? Or what about the moments when we realize just how different we really are? What do we do then? What’s the right thing to do? The healthy thing to do? How does love handle those difficult moments? And we are learning in this series some practical tools through some real-life examples on how to respond in healthy, loving ways to the most troubling and difficult parts of your relationships. 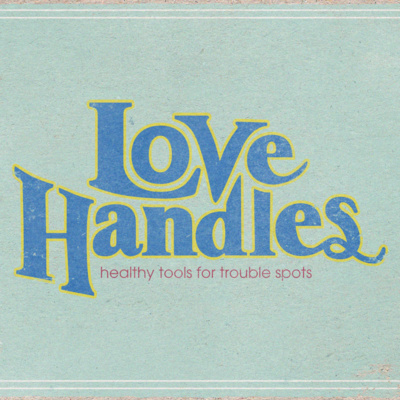 LOVE HANDLES: Week 2 "Love Handles...Hurts"
You see… we’re all looking for love. Deep down inside we’re wanting our romantic relationships to be full of love. And on the flipside...we are also wanting our core relationships to work well and be infused with love. And they do. Well….. some of them. Some…. of the time. You see...It’s easy for us to love people when they act lovable. But what about the rest of the time? What about when they hurt us? Or fail us? Or what about the moments when we realize just how different we really are? What do we do then? What’s the right thing to do? The healthy thing to do? How does love handle those difficult moments? LOVE HANDLES: Week 1 "Love Handles...ALL"
We’re all looking for love. Deep down inside we’re wanting our romantic relationships to be full of love. And on the flipside...we are also wanting our core relationships to work well. And they do. Well….. some of them. Some…. of the time. You see...It’s easy for us to love people when they act lovable. But what about the rest of the time? What about when they hurt us? Or fail us? Or what about the moments when we realize just how different we really are? What do we do then? What’s the right thing to do? The healthy thing to do? How does LOBVE HANDLE those difficult moments? 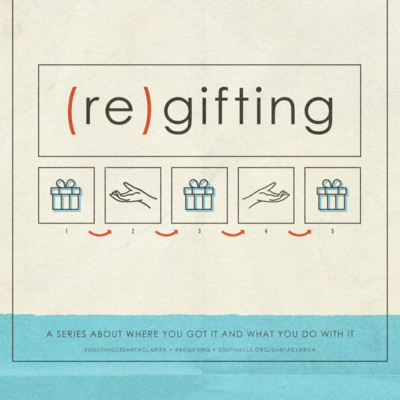 My goal in this series is to give you some practical tools and real-life examples for how to respond in healthy, loving ways to the most troubling and difficult parts of your relationships. We’re talking about “Delayed Gratification.” You see... Success in almost every area of life requires you to ignore an immediate reward in favor of an eventual reward. This is nothing new...we all know this. We see it play out all the time in people’s lives. Most of us know what we need to do to be successful in whatever area of our life we struggle the most in, right?! But here’s the thing... Most people’s problem isn’t knowing what to do, or even getting started, it’s consistent follow-through. So how do we keep engaged ...how do we stay in the game? We can get so obsessed with plotting the perfect thing that we never get around to doing much of anything. Let's get from being in MOTION to being in ACTION.... JUST START! Creating New Habits for a New you in 2019. We tend to do what we’re used to. Which is a problem if what you’re used to isn’t good for you. Get around people & places that make what you want to do clear & compelling to you. Most of us have things about our lives we don’t particularly like. Maybe we know something needs to change, but what, when, how? We’re all busy, but busy doing what? What is all that your doing…actually doing? 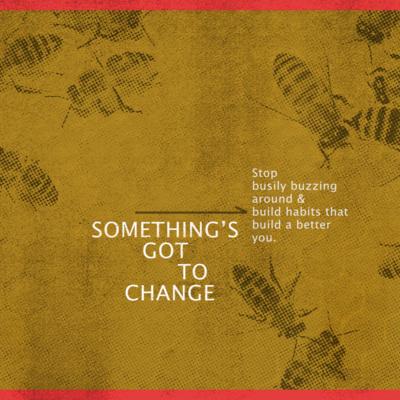 We get locked into certain patterns, but are they creating the outcomes we’re after? 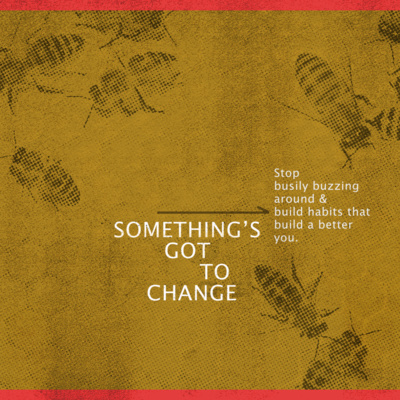 But what if you could redesign your life from the ground up? What if you could stop busily buzzing around and learn how to build habits that actively build a better you? 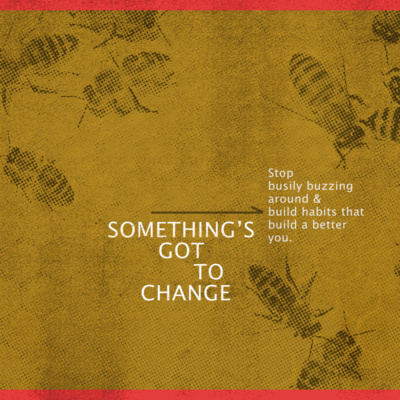 In this series, my hope is to give you a framework to uncover how certain habits may be sabotaging your own happiness, and provide you with a simple four-step process to personally architect your best year yet…..because the truth is... SOMETHING'S GOT TO CHANGE!